i returned to Washington DC yet again for the Sept. 15th march organized by ANSWER and the Iraq Veterans Against the War. After marching from the White House to the Capital, i participated in the die-in at the Capital. Once again, i was arrested crossing a police line as i followed IVAW members, numerous Veterans For Peace members and 165 or so concerned citizens (190 people were eventually arrested), who were intent on delivering a petition to Congress to end the war. Very little mention was made of this march in the mainstream media, and when it was mentioned at all, the facts were widely distorted. Sitting in jail, i had the opportunity to reconnect with several IVAW members as well as Vietnam Vets who i accompanied on the March to New Orleans in early 2006 (to connect the events in the aftermath of hurricane Katrina to the illegal occupation of Iraq). 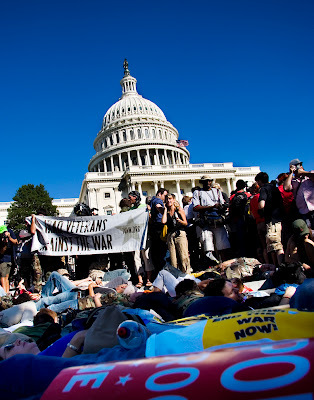 As our government continues to beat the drum for war, one can only hope that more citizens "die-in" to take a stand for peace.